The Carved Ogre Idol is perhaps the coolest of all the redeemable UDE Points in-game loot. It enables the owner to transform into an ogre for 10 mins. The cooldown on this item is also ten minutes, which means it can be used continuously to maintain the ogre form. As of 3.2.2, this item was no longer considered a trinket and therefore only needed to be in a player's inventory for it to be used. If you're having trouble finding one of these loot codes for sale, or if you don't feel like paying hundreds of dollars for an Ogre Disguise, there is a poor man's option. The Magical Ogre Idol is a 2-headed caster version of this loot. 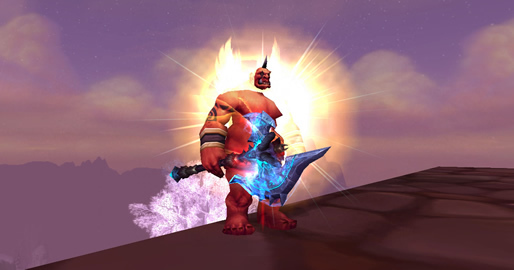 Apart from the obvious visual differences, the Magical Ogre Idol suffers from a shorter duration of 5 minutes, along with a longer cooldown of 30 minutes, meaning you can't remain in perma-Ogre mode. The Magical Ogre Idol loot is not as cool as the Carved Ogre Idol, but it is much easier to find and MUCH cheaper to buy. Unused Carved Ogre Idol loot codes are extremely scarce and if you do manage to find one for sale, prepare to part with a large sum of cash. Click here to check availability and best price for this ultra rare loot. Fast-forward to about the 1:00 mark. Funny stuff.